Countdown to Copake Falls Day, Saturday, August 21, 2010! Not even Mother Nature could put a damper on the day, though she tried hard. Thank you to everyone who braved intermittent showers and waves of heat and humidity to attend Copake Falls Day. It was a spectacularly successful day and we are grateful to all our neighbors and friends (new and old alike) for making the 2nd Annual Copake Falls Day such a success. Our new friend Bee Balm Gal took some beautiful photos of Copake Falls gardens. Take a look at them here: Bee Balm Gal's Blog. Check back soon for more great pictures. We've got the date. 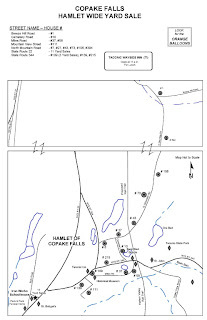 Copake Falls Day is Saturday, August 21, 2010. See you then! Copake Falls Day is a Go! The ground is a little wet from last night's rain but it is NOT raining in Copake Falls this morning! So please join us for a great day, rain or shine! Our schedule is here: Copake Falls Day Schedule. Our schedule of activities, exhibits and events is firming up. Click here to see what we've got planned. We think you'll find something of interest! Copake Falls Day is for kids too! - Click here to see the Kids' Schedule. Please join us for a 5K Road Race in the Wilderness, followed by a Family Fun Run on the Rail Trail. The Road Race in the Wilderness will take runners through some of the most scenic roads and trails of Copake Falls and the Taconic State Park. Begin at the Head of the Rail Trail on Route 344 in Copake Falls (adjacent to the Depot Deli and across the street from Bash Bish Bicycle). Follow the Rail Trail south to Valley View Road. Turn left onto Valley View Road and follow it to the intersection of Valley View and Route 344. Make a hard right turn onto Route 344 for a short distance before turning left onto the South Taconic Trail (the "white" trail). Follow the trail to the Taconic State Park headquarters, cross Route 344 and return to the Rail Trail. Finsh at the Trestle Bridge on the Rail Trail. Meet at the Head of the Rail Trail for a one-mile Fun Run on the Trail. Prizes will be awarded for all runners! Copake Falls Day is for Kids Too! Copake Falls Day offers lots of activities for kids. Here's the schedule - no sign up necessary except for the family fun run. Most events will offer prizes. You could win a new bicycle helmet, bell or pump, or a gift certificate for art supplies (to name just a few) ! All Day events - Wheelin' on the Rail Trail, History Hunt Map Quest, Face Painting, Paige's Donkey Photo Op, Blacksmithing demonstration and Fly Fishing demonstration at the Iron Works Museum, (visit the information table for details Map). Nature walks in the park and swimming in the ore pit! 10 a.m. - Family Fun Run on the Rail Trail. 11 a.m. - Nature Collage - create your masterpiece from nature. 1 p.m. - Scavenger Hunt in the Taconic State Park. 2 p.m. - Artwork for Kids (limit 20 participants). We supply the materials, you create the masterpiece! You will be judged! Thanks to you, we had a wonderful day! By all measures, the First Copake Falls Day Hamlet Wide Yard Sale was a huge success. The weather was sublime, we netted several hundred dollars for the benefit of Copake Falls Day on August 22nd, and most important, we met many wonderful neighbors and visitors. Thanks go out to many people including (but not limited to!) Larry Proper and his amazing Copake Highway Department crew (they always make sure we do it right), the 25 vendors who set up shop either at home or at the Copake Ironworks Schoolhouse, the owner of the Schoolhouse who made the property available to us this year and who has offered it again for next year, the staff of both The Register-Star and the Columbia Paper, and especially, everyone who spent the day snapping up treasures throughout the hamlet. Thanks too, to our fearless leader in this event, Robin Bruce (pictured below) who brought a cool head, big brains and a phenomenal instinct for organization to the party. Robin says, "the success of this sale virtually guarantees a repeat performance next year. But don't forget, this is all about Copake Falls Day on August 22nd. See you then!" That table was empty by the end of the day! Be sure to click on image to see a legible and printable size! Scroll down for locations by street name and number. Large scale printed maps available on Saturday at the Copake Ironworks Schoolhouse ("headquarters") and at the Copake Falls Post Office, the Depot Deli and Bash Bish Bicycle Shop, all on Route 344. May 23, 2009 – 8 a.m. to 3 p.m.
LOOK FOR THE ORANGE BALLOONS! The Copake Falls Day Committee extends many THANKS to all of our supporters, participants and buyers! The map of registered participants for the Copake Falls Town Wide Yard Sale on Saturday, May 23rd is ready! Click here for map of yard sale participants. email us. Fire Truck – all aboard! If you grow, craft or produce something locally, consider participating in our Farmers' Market. We're delighted to announce that Margaret Roach's gardens will be open to visitors from 10 a.m. to 4 p.m. on Copake Falls Day. Margaret is widely known for her gardening blog: A Way to Garden. Her garden tour was a highlight of Copake Falls Day last year and we are thrilled that she has agreed to participate again. You host the Yard Sale. We’ll take care of the advertising and publicity! Have you thought of having a yard sale but wondered whether enough people might come to make it worth your while? 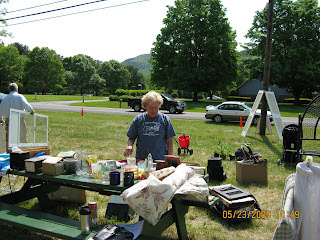 Then you need to participate in the Great 2009 Copake Falls Hamlet-Wide Yard Sale. Sponsored by the Copake Falls Day Planning Committee, the Hamlet-Wide Yard Sale will be advertised in multiple media outlets. We will include your address on a widely distributed map of the Hamlet and we’ll provide you with a big sign and balloons to let everybody know that you are an official participant in the Hamlet-Wide Yard Sale. We’ll also provide you with some tips on how to make your sale successful. But wait! There’s more! If you don’t live in Copake Falls but want to participate you can set up your table at the Copake Ironworks Schoolhouse on Rte 22 just opposite St. Bridget’s Church and Peck & Peck Funeral Home. Plenty of parking, shade and passers-by! To get started, print out the registration form below and send it along with your check for $20.00 to Copake Falls Day Committee, PO Box 25, Copake Falls, NY 12517. Registration must be received by May 19th or email us. Saturday, May 23rd ~ 8:00 a.m. to 3:00 p.m.
Copake Falls Day is Saturday, August 22nd! What Have We Got Planned? Something for Everyone! *Fire Truck – all aboard! Antique cars, local artists and musicians, historic houses and local gardens tours, a Farmers’ Market, special iron making program at the Iron Works Museum in Taconic State Park, exhibits at the Roeliff Jansen Historical Society Museum, visit to a dairy farm, family fun run and bicycle events on the Harlem Valley Rail Trail. Barbecue and square dancing in the evening. Please let us know if you would like to participate as a Farmer’s Market vendor of locally grown or homemade products. Email Us.